Pain or Discomfort in the center of the chest lasting for more than a few minutes or may come and go. The pain feels like fullness, pain, squeezing or pressure. Any of these warning signs should cause immediate action. Call 911 and get to the nearest emergency room. The sooner you are treated for a heart attack the less damage to your heart and better chances of your recovery. Heart attack: A heart attack occurs when one or more of the blood vessels feeding your heart muscle is reduced or completely shut off. A slow process called atherosclerosis is a buildup of plaque (fat, cholesterol and other substances). Plaque can break and cause blood clots to form around it. The clot blocks the flow of blood with its oxygen and nutrients to flow through the heart muscle. This causes a condition known as ischemia. The damage or death of a part of the heart muscle caused by ischemia is called a myocardial infarction (MI), or heart attack, and it occurs in the US about every 40 seconds. You may not have any warning signs of the atherosclerosis process. Sometimes nearby vessels that also bring blood to the heart sometimes expand to help compensate when a coronary artery becomes narrowed. The expanded vessels, collateral circulation, helps protect some people from heart attacks by supplying needed blood to the heart. Collateral circulation can also help the heart muscle recover after a heart attack. Recovery: The good news is that heart attack survivors can lead a full and productive life if they make lifestyle changes and continue to take their prescribed medications. They, however, will always be at risk of some degree of coronary artery disease or Ischemia. The heart muscle usually takes about eight weeks to heal. Scar tissue in the damaged area does not contract or pump as well as healthy muscle tissue. That means that extent of damage to the heart muscle can impact how well the heart pumps blood throughout the body. The degree of loss of function depends on the size and location of the scar tissue. Cardiac Arrest: As explained above, a heart attack is when blood flow to the heart is blocked. Sudden cardiac arrest (also called sudden cardiac death or SCD) is when the heart suddenly stops beating unexpectedly. It is defined as being an electrical problem and is caused by abnormal or irregular heart rhythms (called Arrhythmias) A common arrhythmia is ventricular fibrillation when the lower portion of the heart suddenly starts beating erratically and doesn't pump blood. Death can occur in minutes after the heart stops. Cardiopulmonary resuscitation (CPR) and a defibrillator used to shock the heart and restore normal heart rhythm can reverse cardiac arrest. But they must be performed within a few minutes. Chest Pain: Not all incidents of chest pain is an indication of a heart attack. Angina pectoris is a discomfort that usually lasts for only a few minutes. It is when the heart muscle lacks the oxygen it needs due to reduced blood supply. Angina attacks do not permanently damage the heart muscle and happens during exercise or emotional stress. Your blood pressure and heart rate increase requiring more oxygen to the heart muscle. Any chest pain, however, should be examined by a physician. Discomfort or pain in the chest lasting for more than a few minutes or happening sporadically should be diagnosed by a doctor to make sure it is not a more serious heart attack. A spasm in a coronary artery can temporarily contract causing the artery to narrow and decrease or stop blood flow to part of the heart muscle. A severe spasm can cause a heart attack. A spontaneous coronary artery dissection is a tearing in the coronary artery wall and can cause a heart attack. 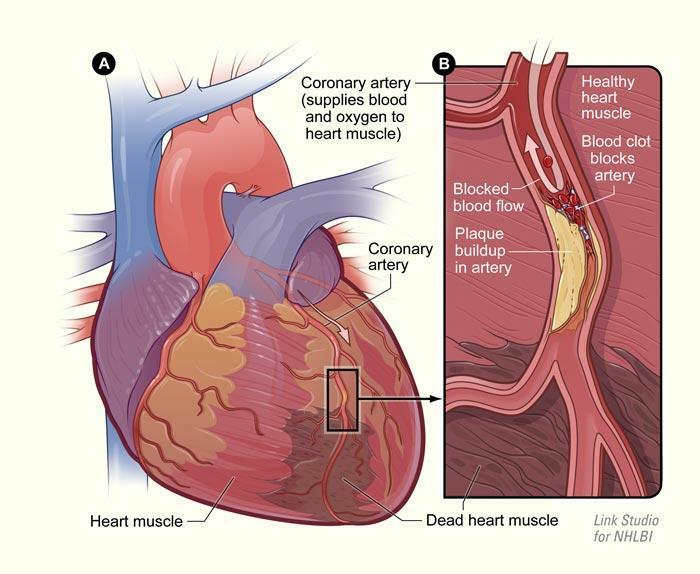 Acute Coronary Syndrome (ACS) – A term used to describe the reduced or blocked blood supplied to the heart muscle. NSTEMI– A non-ST-elevated myocardial infarction, a type of heart attack in which an artery is partially blocked and severely reducing blood flow. Myocardial infarction (Heart attack) – The damaging or death of an area of the heart muscle (myocardium) resulting from a blocked blood supply to that area. Coronary thrombosis (coronary occlusion)– The formation of a clot in one of the arteries that feeds blood to the heart muscle.